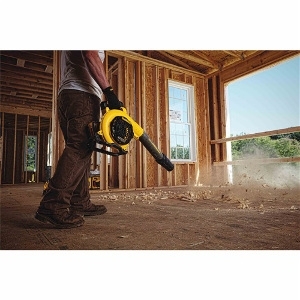 The DEWALT 60V MAX* Handheld Blower powers through debris at 129 MPH. It features a variable speed trigger and speed lock for total power control, and its lightweight and ergonomic design maximizes control and minimizes stress on your arms. It has a 60V MAX* FLEXVOLT battery that powers 60V MAX* tools or it can be backwards compatible to work with 20V MAX* tools.